This plant belonging to family Araceae can grow up to 6 feet, and has a fleshy, waxy stem with large, smooth leaves that are generally green on the periphery and mottled white in the center (Fig 10.1). It is a popular ornamental houseplant. 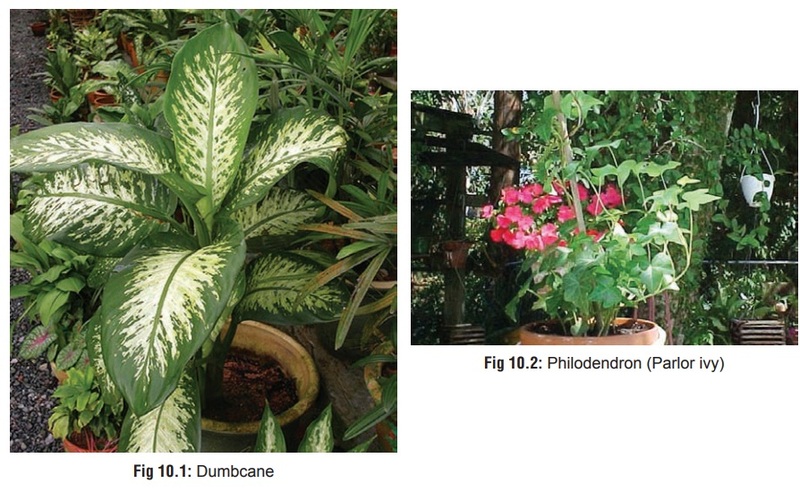 While most houseplants are non-toxic (Table 10.1), dumbcane is among the few exceptions. ■■ The leaves and stem contain high amounts of insolublecalcium oxalate in the form of needle-like crystals packaged in raphides and bundled into elongated idioblasts. The idio-blasts are cigar shaped structures with specialised nozzles at each end, capable of firing the needle-like raphides in the form of projectiles when force is applied (e.g. chewing). Thus when a leaf is bitten into, thousands of idioblasts fire the needle-like calcium oxalate crystals which penetrate mucous membranes and deposit proteolytic enzymes. The latter stimulate a cascade of events leading to release of bradykinin and histamine. ■■ Studies on Dieffenbachia picta in guinea pigs demonstrated the most toxic part of the plant was the stem juice, which, when dropped into the mouths of the animals, caused lip and tongue oedema, nasal secretions and progressive respiratory difficulties. · Most cases of dumbcane poisoning involve oral exposure causing immediate and severe symptoms of pain and local swelling. Patients often describe the intense agony as akin to chewing powdered glass. There is severe swelling of the lips, mouth, and tongue, with salivation. There may be interference with swallowing and breathing. Oral paraes-thesia, with severe pain and numbness in the perioral area may occur. · Ocular exposure to expressed sap may cause immediate pain, lacrimation, photophobia, corneal abrasions, and deposition of calcium oxalate crystals on the corneal epithe-lium. · Systemic toxicity due to calcium oxalate is rare. Bloody emesis and diarrhoea may occur. Vomiting may be profuse. Following large ingestions, oxalic acid is formed in the stomach and subsequently absorbed into the systemic circulation. There it binds with calcium, and may cause hypocalcaemia. This could lead to weak, irregular pulse, bradycardia, hypotension, and cardiac dysrhythmias. 1. In patients with severe poisoning, examine the urine for calcium oxalate crystals. Also, monitor calcium and renal function (BUN, creatinine). 2. Local treatment with cold milk or ice cream as a demulcent is sufficient in most cases. Cold water or sucking on crushed ice will also relieve oral pain. Remove all visible evidence of plant debris from the oropharynx. 3. In severe cases, parenteral opioids, corticosteroids, IV fluids, and endotracheal intubation may be required. Tetany should be treated with intravenous calcium gluconate. 4. Ocular exposure to sap resulting in chemical conjuncti-vitis and corneal abrasions must be treated with copious irrigation, systemic analgesics, and expert ophthalmologic consultation.